During the first week of April, I was blessed with another week off work. Naturally, I had a trip planned for these glorious 7, work-free days. I had been invited to stay with a friend and her family in a small town just outside of Turin, Italy. Ultimately, due to this family’s kindness and hospitality, I ended up having the opportunity to see a lot more of Northern Italy than I could have possibly imagined. This trip also included a long layover and brief excursion to Amsterdam. If you would like to read about ideas and advice regarding what you can do Amsterdam, feel free to click here. Considering that my last three posts have been around 1,000 words or more, I have decided to separate some of the destinations that I had intended to write about together into separate posts…to change things up and put more emphasis on photography of course. So, this brings me to the first place I explored after arriving in Italy: Sacra di San Michele. Sacra di San Michele is a medieval abbey in the Piedmont region of Italy – specifically, it overlooks the Susa Valley. The abbey was not a place I came across while researching and planning my trip. My friend, who grew up in the area, suggested visiting this place. The beauty of the abbey and surrounding landscape was so extraordinary that I am determined to recommend visiting this place to everyone. 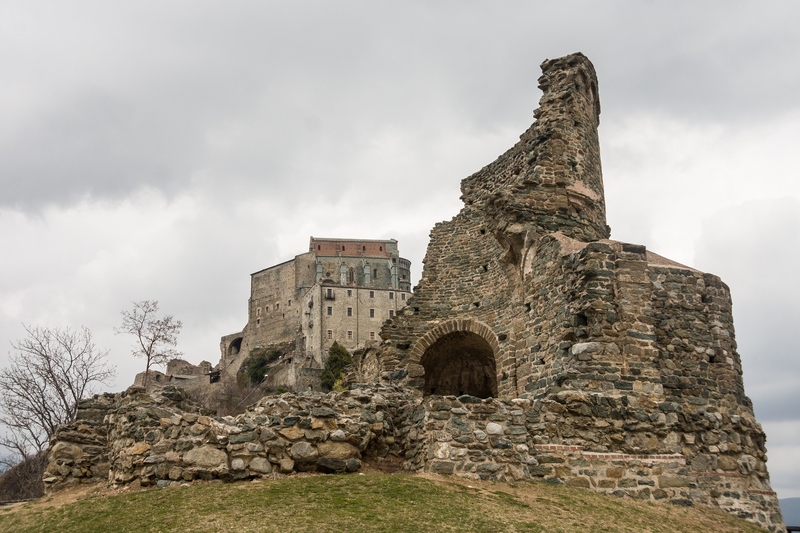 Overall, Sacra di San Michele is the perfect destination for a day trip from Turin since it it’s a 45 minute drive west of the city or a 90 minute train ride + hike (take train 4304 Susa* departing from Torino Porta Nuova. Get off at S. Ambrogio). Historically, the abbey was a pilgrimage site, and today, many of its visitors are people interested in places of worship. 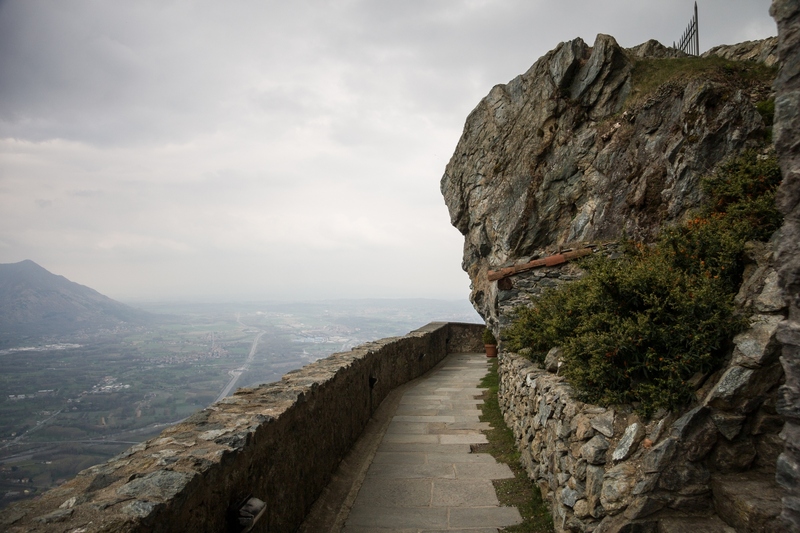 However, I guarantee that even if you’re not keen on exploring holy sites for their religious importance, Sacra di San Michele is worth a visit. The abbey itself was built on top of a small mountain and sits at an altitude of nearly 1000 metres. Every ledge or outdoor walkway in the abbey gives you a breathtaking view of the Cottian Alps and surrounding valley (yes, these are the famous Alps. The “Cottian” part refers to the mountains found in the south-western Alps). Hours could be set aside for just admiring the remarkable landscape. As well, it’s impressive to see such an old and elaborate building situated on a mountaintop still standing today. 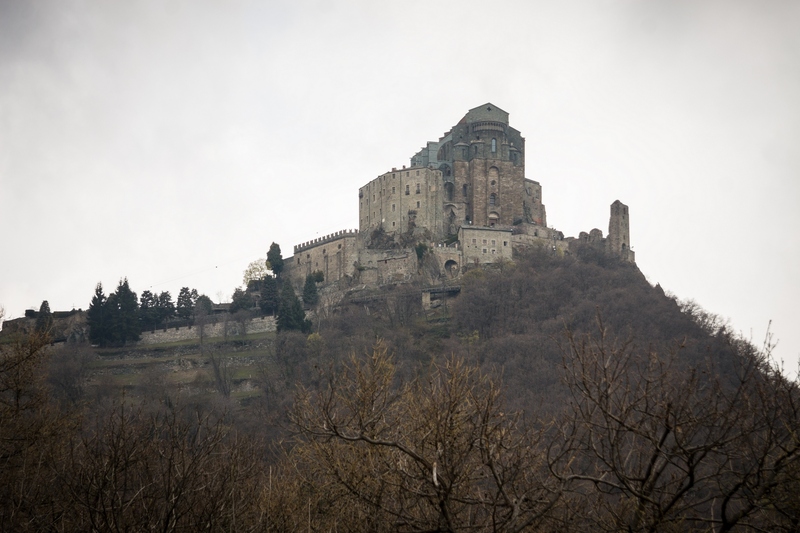 (Sacra di San Michele started being built right around the start of the 11th century and construction continued for the remainder of the century). Obviously, building such structures in such remote locations over 1000 years ago was not nearly as easy as it is today. It’s outstanding to see. A view of Susa Valley from Sacra di San Michele on an overcast, yet beautiful day. As mentioned earlier in the post, the abbey was a pilgrimage destination during the Middle Ages. 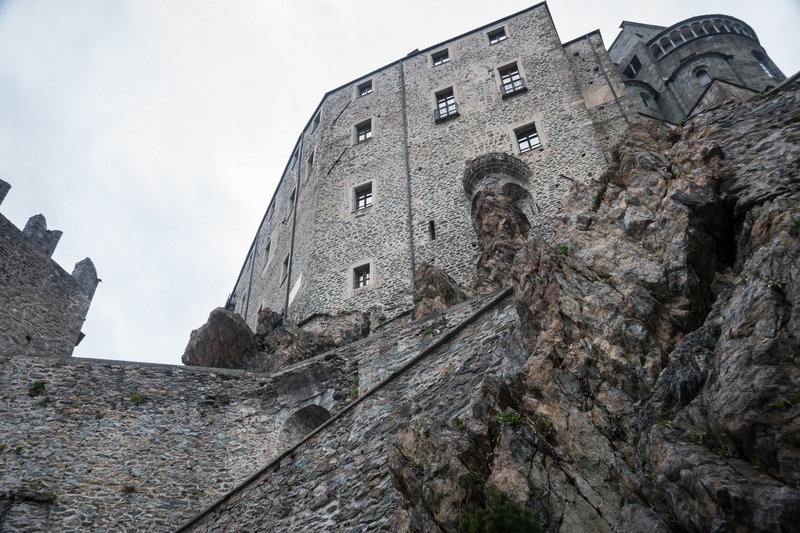 A pilgrimage involves travelling to a place of religious significance – and during the medieval ages, a place like Sacra di San Michele could only be reached by foot. Therefore, mountain trails can still be found around the mountain for visitors to explore. Walks along these paths offer even more incredible views of Piedmont, Italy…and a chance to get a bit of a workout if that’s on your holiday to-do list (there are also plenty of steps to climb in the abbey itself). More views from the abbey. Fortunately, in addition to stairs, there are also many walkways in the abbey with slight inclines/declines winding around the mountain top. Nevertheless, the importance of the abbey and surrounding valley goes beyond religious history. Evidence of human activity can be found on the mountain predating the common era (BCE). 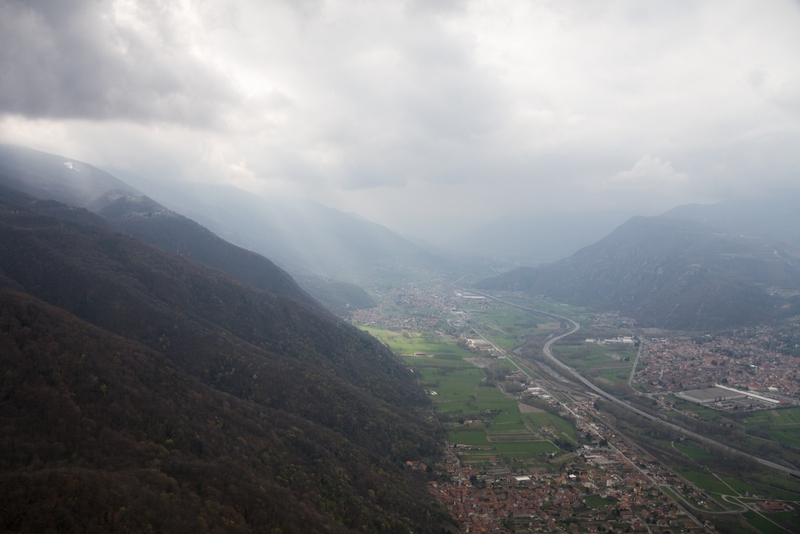 As well, during Roman times, strada delle Gallie, and during Medieval times, via Francigena passed through the Susa Valley beneath the abbey. These routes played a key role in connecting Northern and Southern Europe. 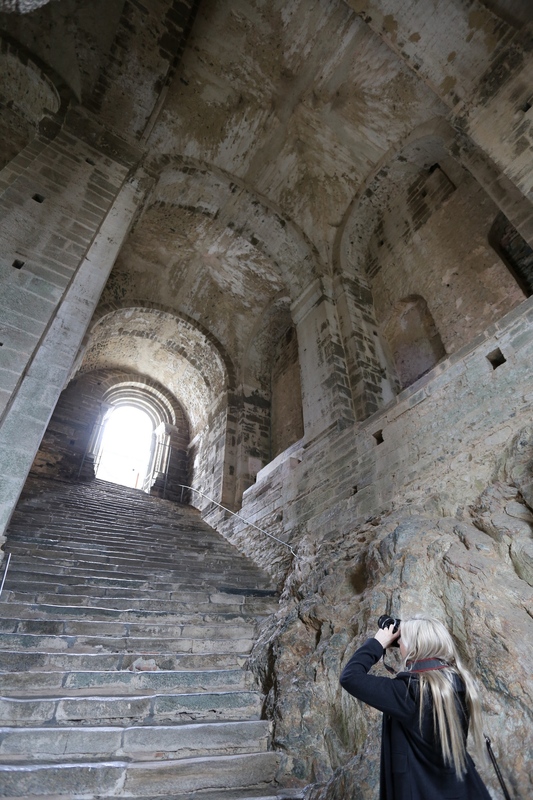 Taking photos of the “Stairway of the Dead” within the abbey. Once, skeletons of monks used to be displayed here. Here, photo and wide-angle magic credit (which makes my hair look infinitely longer than it is) goes to Electric Blue Food. 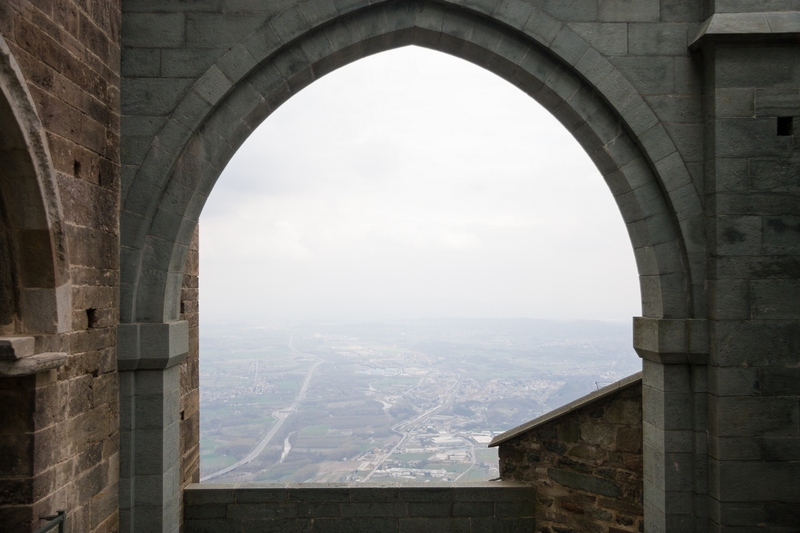 To wrap up this post (and yes, I see that I have blabbed on for over 700 words), I hope that I’ve been able to show you that Sacra di San Michele and the surrounding valley is not only visually spectacular, but it is also a place rich with history. It looks magnificent on both sunny and overcast days (personally, I felt that the overcast weather added a mysterious atmosphere to the place which simultaneously brought out its age and beauty). In my books, it’s a destination that is not to be missed when visiting Piedmont, Italy. Looking towards Turin from the abbey. For more information about the abbey (I didn’t want to provide an overload of info in this post), please visit its website by clicking here. *Please double check train schedules and numbers beforehand, as changes to timetables can always happen. Your trip sounds amazing! The pictures are so beautiful! Thank you so much! Piedmont is one beautiful region! Sorry it took me so long to come and comment. I’m glad you did some research to understand how important and strategic this place used to be in the middle ages. To me it’s magical and I’m happy you liked it. I am so jealous! This is one of my dream places to visit! I’m sure that you will have the opportunity to make it happen1 🙂 It’s super accessible from Turin by so many modes of transportation! I haven’t heard about this place and I’m glad I read this from your blog. You take beautiful pictures and I love how you tell your stories. I don’t think it is the most popular/famous place – locals from Piedmont introduced me to it. And thank you for the compliment! I really enjoy writing and am working hard to improve it even more with every post.